Do you ever go through a phase where you’re mildly obsessed with one writer? A few years ago it was Thomas Hardy, but I’m in a big Flannery O’Connor phase right now. It started last year when I read a biography and most of her short stories as part of my 50 book goal. The more of her work I read the more interested I became in her story. O’Connor was a Georgia native, and her fiction is distinctive because it deals with the American South in an often shocking and grotesque way. 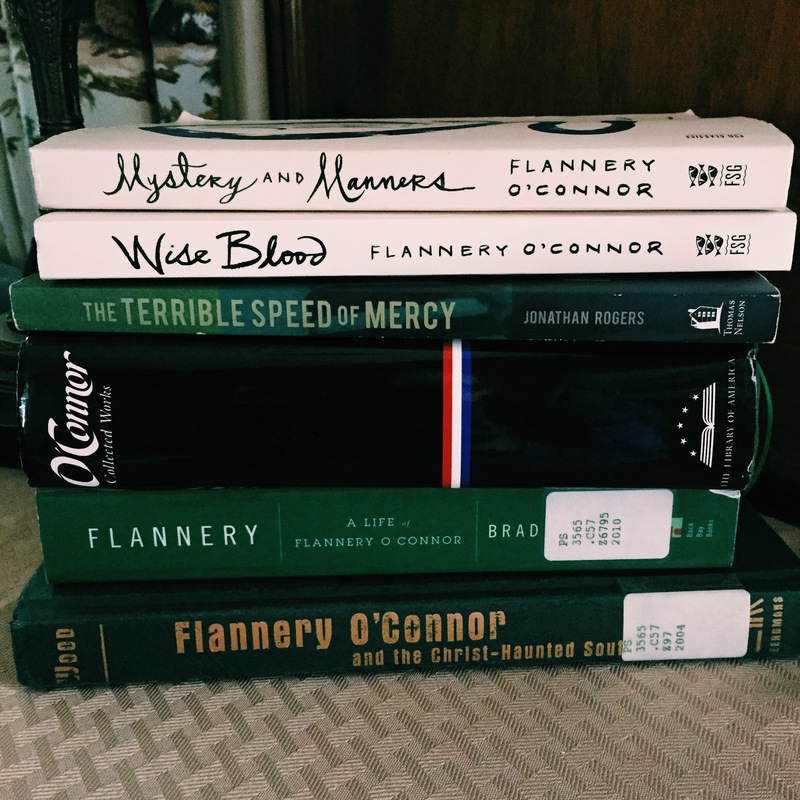 I was interested to learn from Jonathan Rogers’s biography The Terrible Speed of Mercy that O’Connor was a devout Catholic, and her religious beliefs influenced every story and novel she wrote. Rogers’s “spiritual biography” of O’Connor paints a picture of her as a devout and faithful woman who was concerned with how fiction writers can portray the larger mysteries of the spiritual world through their fiction. This is a concern that I feel very strongly. How can I as a writer portray the beauty of what I believe without it sounding trite and overworked? This summer I took an online creative writing class called Writing with Flannery O’Connor. The class was taught by Jonathan Rogers, the author of The Terrible Speed of Mercy. I’m not sure how well I was able to write like O’Connor, but the class was fascinating. I’m currently researching O’Connor’s writing process for one of my graduate courses. All of this research made me realize it was time to jump into O’Connor’s novels. I’m working on Wise Blood right now, and on my first day of reading I managed to read half of the novel. Look for that review soon! I’m sure I’ll get around to her second novel eventually, but after reading part of Wise BloodI think I’m going to need to slow down and really focus. There is so much to think about and discuss in that novel. What authors inspire you the most? Do you find yourself in phases of inspiration? I’d love to hear!